Emotional Freedom Technique (EFT ) sometimes called “Tapping” or “Emotional Acupuncture”, is a natural cognitive and meridian energy therapy, a combination of ancient chinese acupressure and modern psychology. 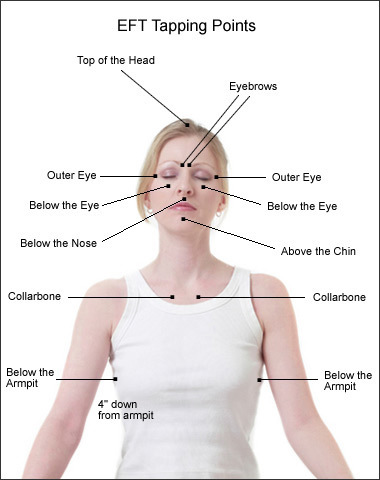 It is a natural technique of tapping on end points of the body’s energy meridians combined with focusing the mind on a specific emotional issue or problem. It is a simple self-help technique that anyone can learn and use instantly when needed. The many negative emotional experiences we have disrupt the energy meridians that run through our body. The physical changes we feel from those stored memories, such as anxiety, become attached to the memory of that experience and affect the way we see the world…until we heal that disruption and release the stored energy. Properly applied, EFT quickly realigns the energy meridians with respect to negative memories, disconnects the physical discomfort that we attached to it, and quite often removes the resulting symptoms. EFT can be used to help overcome overwhelming negative emotions such as fear, guilt, shame, jealousy, or anger, assist in changing unwanted habits and behavior and enhance your ability to love, succeed, and enjoy life. Fear, anxiety, stress, PTSD, phobias, eating disorders, weight issues, procrastination, insecurity, depression, physical pain, fear of public speaking, panic attacks, shyness, self image, lack of confidence, trauma. Try it on anything that is bothering you. By tapping and stimulating the end point of the meridian system we can release the negative blockage and restore balance by encouraging the natural flow of energy. This combined with the verbal acknowledgement and maintaining mental focus on the issue, while concentrating on accepting and resolving the negative emotion – will access your body’s energy, restoring it to a balanced state. ​While EFT and its various applications have produced remarkable results, it is considered to be in the experimental stage and thus practitioners and members of the public must take complete responsibility for their use of it. Individuals need to take responsibility for their own health and wellbeing. EFT is not a substitute for competent consultations with medical doctors, psychologists or psychiatrists. As EFT is not meant to replace qualified medical advice, please consult medical professionals regarding your health. If using EFT while you are taking medication for conditions such as diabetes, high or low blood pressure, thyroid conditions or heart conditions it is advisable that you be closely monitored by your doctor. Do not alter your medication dosage without consulting your doctor. 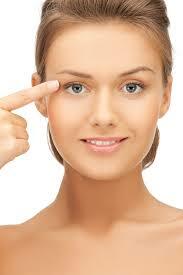 EFT can have an effect on you that may require adjustments to your medication on medical advice. EFT is a complementary aid for improving well-being and does not diagnose.